When faced with the difficult dilemma of whether to use performance ram, or maximize your efficiency with a high capacity kit, a bright shining light appears leading you through the fog of confusion. Let there be Patriot! Try not to stare at it directly, it might hurt. Lets see what they say about it. According to Patriot this high capacity, high speed kit promises to remove the dilemma completely. They have certainly set a high bar for themselves lets take a closer look and see if the vipers strike falls short. 11 Comments... What's your say? You left DOC turned on. Not a good idea to overclock while evaluating RAM. How would you go about evaluating 2000mHz RAM without overclocking? He tested the RAM at whatever speeds it is intended to run. If they had stated that it was 1333mHz RAM, he would have left it at stock speeds to test. How else should he have done this? 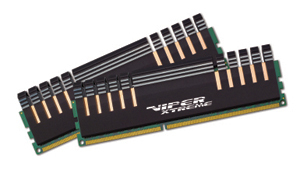 It is an Xtreme Ram kit intended for overclockers and performance enthusiasts. As such OF COURSE we are going to overclock it. If you ask the question why we overclocked it then perhaps you should stick to the generic ram available at best buy or online. Someone forgot to change their tampon this morning.,..haha! !